AI is hot, and it is expected that insurers will increase investments in artificial intelligence. As mentioned in recent insight by Nicolas Michellod titled Leveraging data and AI in insurance, there is a growing proportion of insurers who invest in artificial intelligence. It has been a few years that we have seen specific interest in data from insurers, and more specifically how they can leverage advanced analytics and artificial intelligence to make optimal business decisions. Since then, many have tried to link insurers and AI, with some good generalistics research out there. However, Celent’s Craig Beattie, Nicolas Michellod, and Zao Wu have published a series of reports dedicated specifically to AI and its newborn relationship with the insurance sector. The first of these reports, Demystifying Artificial Intelligence: The Tools Supporting Modern Data Science and the Rise of DataOps, provide a review of the tools and technologies including DataOps insurers can invest in to launch AI initiatives. 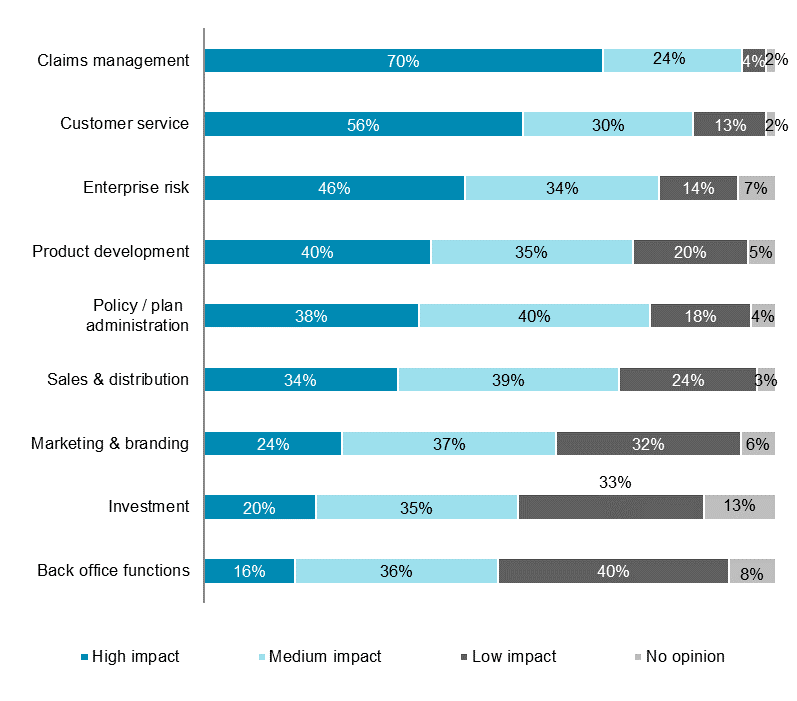 Demystifying Artificial Intelligence in Insurance: A Tale of Two Models, or how it is called the second report, looks at how insurers can organize internally to optimally run AI projects. It notably details our view of the combinations of tools and people, insurers can use to work on these projects. Finally, we thought it would be important to get the insurance industry perspective on AI, and this is the topic of the third report, Demystifying Artificial Intelligence in Insurance: The Industry Perspective. In this report, we present the results of an insurance survey dedicated to AI. Cattolica Assicurazioni Automatic Damage Estimation engine that generates automatic car’s damage estimation trough processing claims photos by an artificial intelligence engine. IndiaFirst Life Insurance: Various models including surrender prediction and product recommendations engines, whose objective is to reduce policy surrender numbers through better identification of customer-initiated incidents and following up with targeted campaigns. Munich Re America’ Smart Mobility Loss Analysis Tool to identify the core causes of loss of road crashes through both predictive and prescribed analytic techniques. Taikang Insurance Group’s Customer Identity Verification Platform leveraging biological feature-based customer identity to support decision-making processes notably in claims and underwriting. These are just few examples of AI interference within the insurance sector, though there are many more cases that can be found a report titled Model Insurer 2018: Case Studies in Data, Analytics, and Artificial Intelligence. “Going forward we expect insurers to increase their investment in AI and we think they will prioritize domains having a high impact on their core business and therefore their technical ratios. We will continue to follow their progress around AI and its application not only in claims and customer service but also in other key areas such as underwriting,” they said at Celent.